superdumb supervillain: Jasper is Tagged! 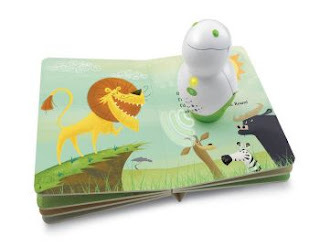 Jasper is always running off with Roo's Leapfrog Tag Reader so we were pretty excited when we heard about the new Leapfrog Tag Junior, a similar learning device made for younger book lovers. Like its older sibling the Tag Junior also allows parents to view their childrens' progress online via the Learning Path. Since the audio component is stored in the Tag Junior, you can see what your child was engaged with and for how long, not to mention what they might be struggling with or be drawn to from an academic standpoint. For example, it tells me that "Jasper recently spent 22 minutes engaged with Tag Junior Included Title- If I Were" and that the skills he has explored include "Reading Basics, Comprehension and Life Science." I think it's a great device but I have two issues with it and with its predecessor: first, it's a big pain to only be able to access the audio for five books at a time. It's not a big deal or particularly difficult to plug the reader into the USB drive and transfer files but it would be awesome if you didn't have to and could just download the information every time you bought a book. Secondly, I was disappointed that you can't download the audio files from regular Tag Reader books onto the Tag Junior, although apparently you can read Tag Junior books with the original Tag Reader. Since Roo has amassed quite a library of Tag Reader books, it would be great if Jasper could "read" them with his Tag Junior, too. I know there are many titles that appeal to both age levels, especially the classic storybooks like Chicka Chicka Boom Boom, which Roo and Jasper have enjoyed together often. 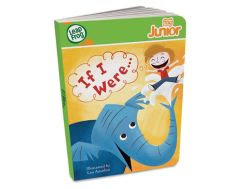 It would be great if Jasper could use his Tag Junior on that one, even though it's technically his sister's book. I'm crossing my fingers there will be a way to do that eventually. Other that that minor quibble, to say that Jasper enjoys the Tag Junior would be an understatement! Leapfrog provided the Tag Junior for our review but we did not receive any additional compensation. Just so you know. Darn right he looks pleased. I'm glad to see Leapfrog came out with one for the younger kids. I definitely need to look out for one of those things. Looks fun! And we're already running out of bookshelf space. I really need to get a Leapfrog for SoJo. They seem so cool, and he loves things that make sound and books, so it would be a double-win. I can't believe how much older J looks with that haircut. Such an adorable big boy now! That does look really neat! How cute is he in those pics too?